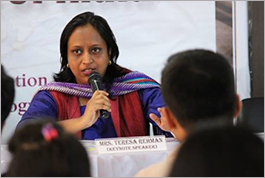 June 19, 2012 — Indian journalist Teresa Rehman says she is “living a dream” by working on her new entrepreneurial venture. 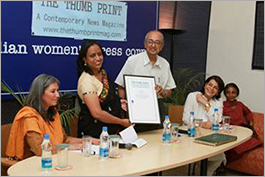 Rehman started The Thumb Print, an international news magazine based in Northeast India. The online magazine helps shed light on the often under-reported stories from the region, Rehman says. “Unveiling the mystifying facets of this trouble-scarred region has always been cathartic — a realization that underneath the turmoil lies a hope for peace,” she said. 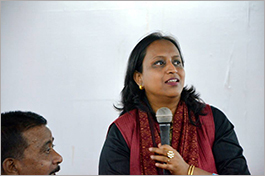 Rehman, who participated in 2008 and 2009 IWMF initiatives on women and HIV/AIDS policymaking, shares her thoughts on The Thumb Print and offers advice for other women interested in starting journalism ventures in a Q&A with the IWMF. “One cannot sustain any entrepreneurial venture without passion and dedication,” she said. Read The Thumb Print: www.thethumbprintmag.com. IWMF: How did you decide to start The Thumb Print? Is the magazine online only, or does it have a print component? Rehman: In The Thumb Print, I am actually living a dream ? a dream to be visible and audible to the world. I need to be heard and seen as I hail from an under-reported part of India — the Northeastern region, which comprises of eight heterogeneous states of the Indian union. … The region has witnessed decades of violent insurgency and has always remained in the periphery of the Indian consciousness. The region with a predominantly tribal population has often been ghettoised as a monolith and has grossly been misrepresented by the so-called ?mainstream? media. We are in news for the wrong reasons ? for violence, bloodshed. The region has often been projected as underdeveloped and unsafe. I have personally reported from this region for many ?national? media houses in India and have always struggled to find space. I have been told many times that the ?region? does not sell. The region has always been far removed from the corporate radar and does not interest the advertisers. I have been pained by the lipservice paid to the region. I decided to create my own space and take the region — which is full of untold stories of men, women and children — to the world and bring the world closer. We wish to be international, savvy in our outlook towards the rest of India, South Asia, and the world. This is an online magazine at the moment. In the times to come, hopefully, we will be able to garner enough resources to be able to come up with a print version as well. IWMF: What kind of topics does The Thumb Print cover? Rehman: We want to chronicle the lives of the common people of the region and tell living and vibrant tales. We also want to bring home fascinating stories of people from different parts of the world. We want the world to have a refreshing look at the region. This is a dream to go global with local stories — tales of the marginalized, the under-reported, criss-crossing through geographical terrain and psychological barriers. Our soul lies in Northeast India. We hope to live and delve in the contemporary times and tell stories with a difference. We want to act as a bridge between the region and the world. I have long years of experience of reporting from the region and I always said that the region is a ?paradise for journalists?. Unveiling the mystifying facets of this trouble-scarred region has always been cathartic — a realization that underneath the turmoil lies a hope for peace. IWMF: This is a new entrepreneurial venture for you. How did you secure funding, advertising and contributors for the project? Rehman: Believe it or not, this magazine has evolved more like a cottage industry. I am running this magazine from my laptop and my living room in a remote district located in Assam, a state of the Indian union. This is the might of the cyber world. I have invested my hard-earned savings and set up this portal. Usually people look for finances first and then go for a venture. I decided to work the other way around. I wanted the world to have a look at my work first and then generate revenue in the form of advertisements. I am thankful to my friends and family who supported me and had faith in my enterprise. And the way digital technology and social networking sites connect the world is amazing. We have been able to create our own space in the virtual space. In fact, it?s a whole virtual space at work. I gather editorial content in a remote part of Assam, and it is being edited and honed by our Consulting Editor M. Radhika sitting in Delaware in the U.S. 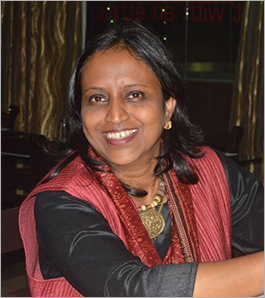 I discuss the editorial content through email or phone with another Consulting Editor, Monideepa Choudhury, who is a senior colleague and has a good understanding of the dynamics of the region. And my pillar of support has been my husband, Raza, who handles my two little angels while I am engrossed in work. I am multi-tasking from conceptualising to actually making things work. We hope that the quality of our work will attract advertisers and we hope to generate revenue to be able to sustain this ?dream?. IWMF: What do you hope to achieve with The Thumb Print in the future? Rehman: As I had said, I am chasing a ?dream?. It?s more like a mission for us. I am investing my savings, time, energy in this ?dream?. It?s not an easy task being a mother of two little children. We are not hankering for immediate commercial benefits, but we are delving into a long-term evolutionary exercise. But I have a feeling that we will be able to sustain ourselves and evolve into an institution one day. IWMF: Do you have any advice to share with women journalists hoping to start their own news business or website? Rehman: I think one needs to have a clear vision and objective before venturing into any kind of enterprise. And more importantly, one cannot sustain any entrepreneurial venture without passion and dedication. It is also important to pick up nuances of the new enterprise. For instance, the technicalities of running a website is a new learning experience for me though I am not a very tech-savvy person. Now I have to pick up the nuances of online advertising, packaging and branding. It is a lot of hard work but I am enjoying every minute of it. Quality editorial content is our forte, and we hope to live up to the expectations of the market forces. As a woman, this venture is a fulfilling experience in the sense that I have been able to work from home and take care of my two daughters simultaneously. I am my own boss now. I have something that I can call my own. 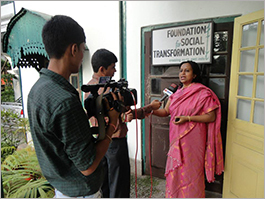 In fact, enterprising women journalists can take advantage of the immense potentialities of the cyber space and carve a niche for themselves. Intrigued by our articles about Journo-preneurship? Find more articles here.